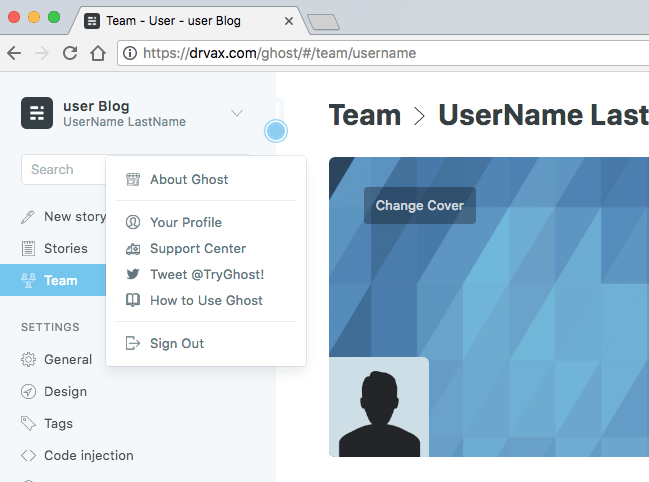 This tutorial is designed to both introduce the read/viewer to Ghost, an up and coming blogging platform, and provide sufficient detail so a novice with little experience with AWS can configure a blog, secure it, upload a theme and start blogging. Warning. This post is not a typical DrVax post as it assumes extensive computer software experience. Most DrVax posts target people with little pre-existing technical expertice. 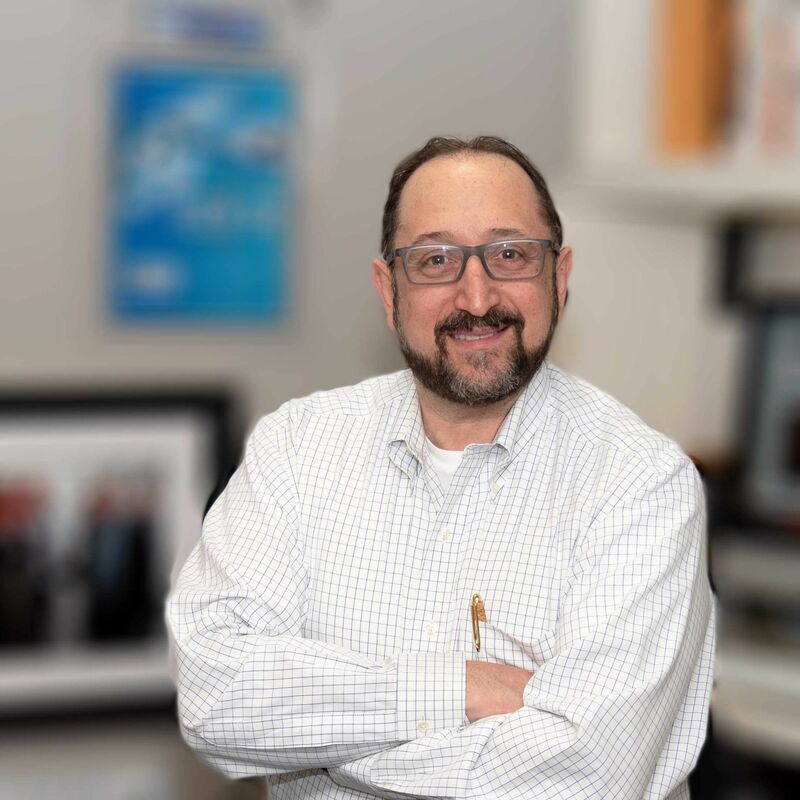 Prerequisite knowledge: This tutorial does assume the read has a basic understanding of Linux commands and Linux administration. Since this tutorial covers basic AWS administration it is a good basic introduction to AWS for a Linux administrator new to AWS. This tutorial was built using Ghost 1.x however, the majority of the content is the same for Ghost 2.x. Furthermore AWS is a moving target. Amazon updates and enhanced the AWS user interface and services many times a year. While some of the keystrokes may change the concepts will remain the same. A key pair consists of a public key, you can think of this as the lock, and a private key which acts like a key your might keep in your pocket. However unlike traditional keys these smart cryptography keys may be limited for use by specific entities. When AWS creates a new key pair it only displays your private key one time but it provides you the ability to save this private key to a file with an extension of PEM. You will need to have access to this PEM file anytime you want to access a server, system, service or storage area with your key. When you create a keypair, a file with an extension of PEM and the same name as you keypair will be downloaded to your computer via your browser. Do not lose this file! It has your public security key which you will need to log into the AWS instance. Bitnami has automated the ability to package, deploy and maintain applications, lowering the barrier to adoption for anyone to deploy and maintain a full spectrum of server applications, development stacks and infrastructure applications in virtually any format. 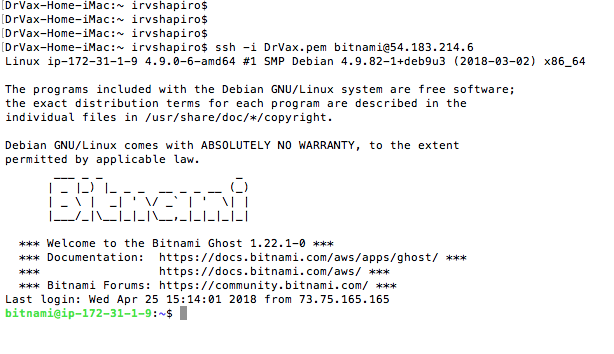 For this tutorial, I used a Bitnami community Machine Image since it included a later version of Ghost than the Bitnami AWS Marketplace Image. Both are free however the initial AWS instance username may be different. Depending on the Bitnami images the initial username might be “ubuntu”, “root”, or “bitnami”. The instance (Linux) username, in this case, is “binami” and the password is supplied by the Key Pair file. In this case DrVax.pem. From a terminal window on your PC or Mac or via an SSH application, for example Putty if you are using Windows, or the SSH command from the OS X terminal, login to the instance. If you are using an SSH application from OS X or Linux you will need to change the protection on the PEM file. The following command can be used to do this. 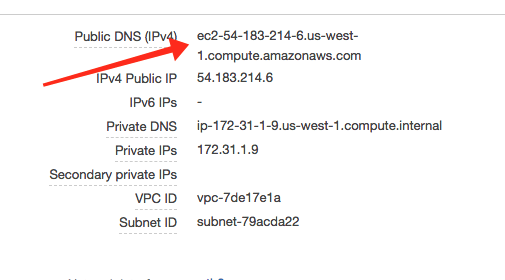 Then you need to obtain the IP address of the remote machine from the AWS EC2 dashboard. When you connect you will be prompted to authenticate the security answer yes. This will add the IP address you are connecting with to your local computers approved list. Now let’s make sure Apache, MySQL and Ghost are running. We see Ghost is not running yet. So let's start it up with a default configuration just to make sure the basic SW is installed correctly. Before we can access this website/blog we need to add HTTP (browser) and HTTPS (browser secure access) to the AWS instance. We can just add these rules to the security group defined by Bitmani for the instance. Some of the Bitmani configurations already do this for you. Some do not. 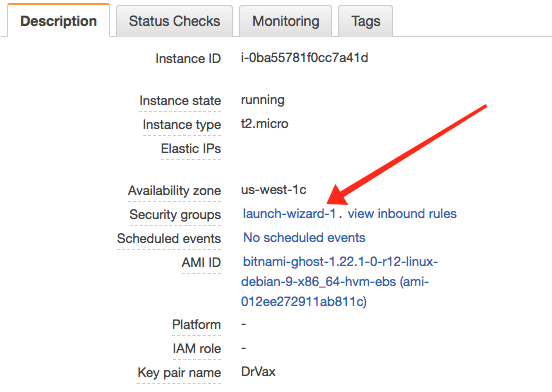 To check just click on the “view inbound rules” link in the AWS console and check for HTTP and HTTPS access. In the case of this AMI we need to use the following option to configure our access rules. 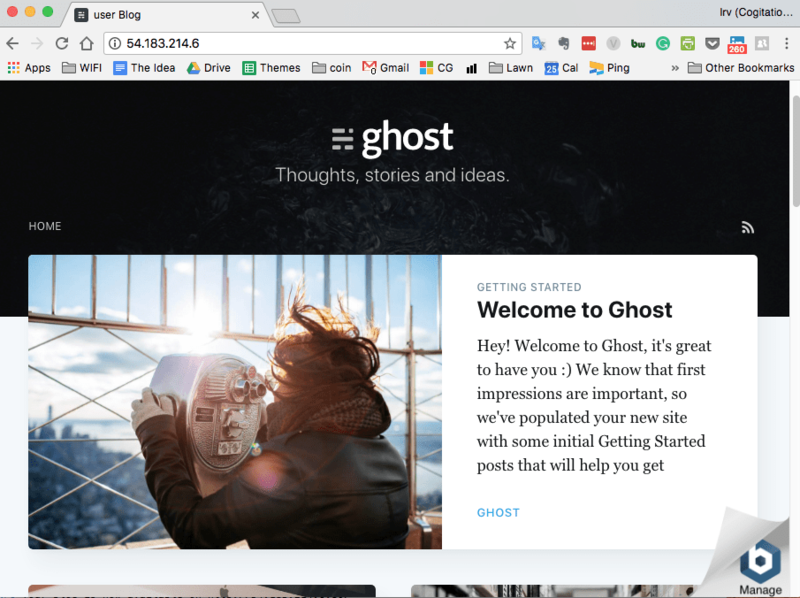 Now that Ghost is running with proper inbound access rules we should be able to go to the address listed above and see a blog with the Ghost sample stories. To do that we will need the Ghost administrators username and password. There are two ways to get this. We access a file with this information in the Bitnami home director on the server or we can look in the instance log file. Look through the output of the system log for the following banner. This is where Bitnami provides you with the initial username and password for your Ghost instance. Did you verify ghost is running with a ghost status command? Are you using the correct IP address http://ip-address? Did you verify that the security group in the EC2 instance includes access for port 80? Check the log produced with the command ghost log for errors. For your username and password enter the information your retrieved for the instance log early. By clicking on the username in the upper left hand corner you can access the dialog to update your profile. Replace the existing information with your information. Make sure to scroll all of the way down the page and change the password for the administration account. Feel free to play around with the content, add users under the “Team” tab and then browse to the site without the /admin to explore how content editing works. We will cover Ghost content and themes in other tutorials. To assign our own domain name to the instance we could use a “cname” or depending on the domain service we are using we could even just forward our domain name to the name listed above. However to provide more flexibility and security we will want to hide our IP address and the AWS assigned name from our users. Why? Because if we change the instance or even stop and restart it this name will change. The first step in providing a permanent name is to use the AWS interface to allocate an elastic IP address to our account. Elastic IP address are permanent and remain in your account until you release them. Then we will point this Elastic IP address at our instance. Now we need to tell Ghost that we changed its address. We do this by editing a Ghost configuration file on the server. However since we just changed the IP address of our instance we need to use the new elastic IP we assign. If you previously used this elastic IP address for a different instance then you will receive the following error message since SSH wants to ensure someone isn't spoofing your IP address with another host. To remove the old authorization issue the following command which will remove the old authorization for IP address 54.177.2.227 which is your Elastic IP address. After re-connecting via SSH you will have to re-authorize access to this IP address, since your deleted the authorization with the ssh-keygen command above. Now we can configure ghost to use the new Elastic IP address. If you tried the new Elastic IP address at this point it may seem to work. However if we do not change this in the Ghost configuration file some of our links will still point to the old IP address. To change a Ghost configuration file you will need to either use an SFTP client to copy the file from the AWS instance to a local file, change it locally, and then copy it back, or just edit it in your SSH terminal session. Since SSH is a command line environment you need to use an editor that runs from the command line on Linux. While many “professionals” use VI or VIM and improved version of VI, I recommend to get started you use Nano which will feel much more like a traditional editors/notepad. Ok to get started SSH into your instance and then change your directory to the following directory. Before we get started, make a copy of the configuration file in the event we mess something up. to verify that file contents has change. Now let's restart Ghost and try it out from a browser. In the above example I am pointing www.drvax.com, drvax.com, and any sub-domains for example blog.drvax.com at the Elastic IP address 54.177.2.227. It is important to note that it can take quite a long time for new domain name service information (DNS) to propagate across the internet. You will not be able to access your instance with your domain name until this has occurred. Once your domain is pointing at your IP address we can go ahead to the next step and secure our blog by moving it from an HTTP address to an HTTPS address. Now as a final step we need to edit the Ghost config file and check our blog address from an IP address to our new domain name. 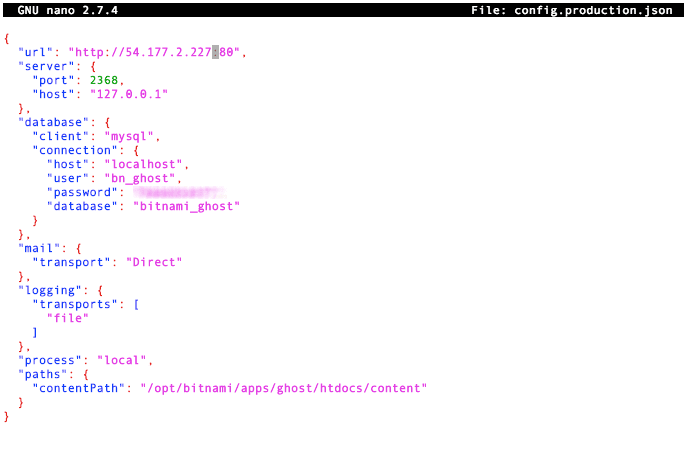 Edit the config.production.json file which is located at /opt/bitnami/apps/ghost/htdocs. Now try out your new site by browsing http://drvax.com, replacing drvax.com with your domain name. We will use a "Let's Encrypt" certificate to secure our web site. Once the web site is secured access to our site will be provided by HTTPS instead of HTTP. All traffic transmitted over an HTTPS link is encrypted. First we need to install the Let’s Encrypt software and its supporting components. Many utilities exist for managing your Let's Encrypt certificates. We will use the utility recommend in the Bitnami documentation. Here are the steps as documented at this time. The details of what each of these commands does are beyond the scope of this guide. So for now just cut and paste these commands into your SSH session that is at the Linux command prompt. We will use one of the Let's Encryp clients, called "lego", to generate a security certificate needed to enable HTTPS for your site. To install "lego"you need to log in to the server console as the bitnami user. Then cut and past the following commands to install the Lego software. Please note the curl command includes all of the parts including | wget-i - which wrapped to the next line. Now lets unpack the file. Please note the file downloaded might include a version number in the name. After unpacking the file move the whole directory to you executable image directory. Please note: the executable's name, in this case lego has been different with different versions. The ctlscript is provided by Bitnami and will not exist with installations from our sources. 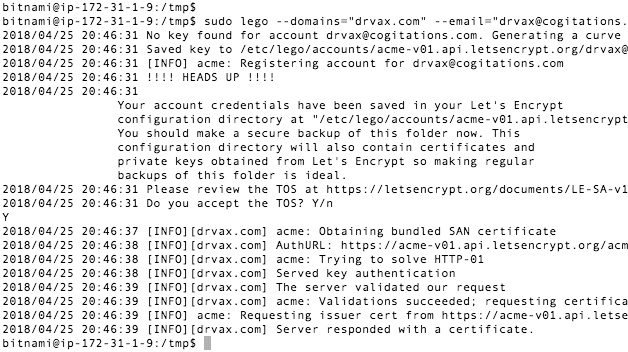 Use the lego command to create our security certificates and then move them into the proper locations. Make sure your replace drvax.com and the email address with your sites information. What is most important is that the last line indicates we were issued a certificate. Before proceeding I recommend verifying that the directory /etc/lego was create and contains two subdirectories accounts and certificates. If these files do not exist it is likely that your mistyped the /etc/lego directory name. I have made the mistake for example of excluding the leading slash. Now we have one more problem to solve. 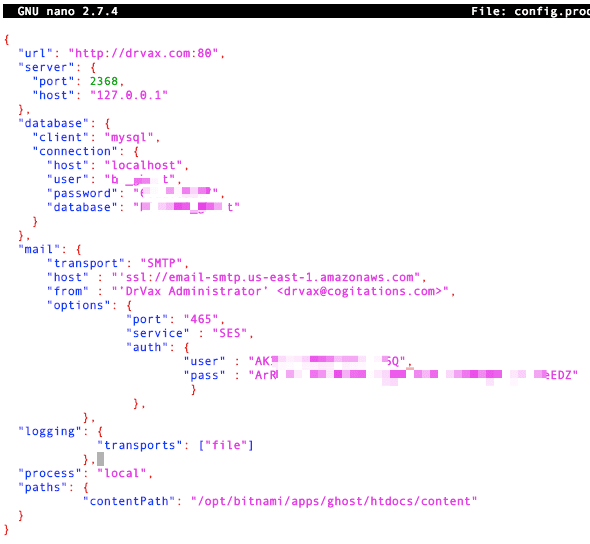 While https://drvax.com works, http://drvax.com also works. We want to force all users to the secured, https site. To do this we need to edit the apache configuration files. 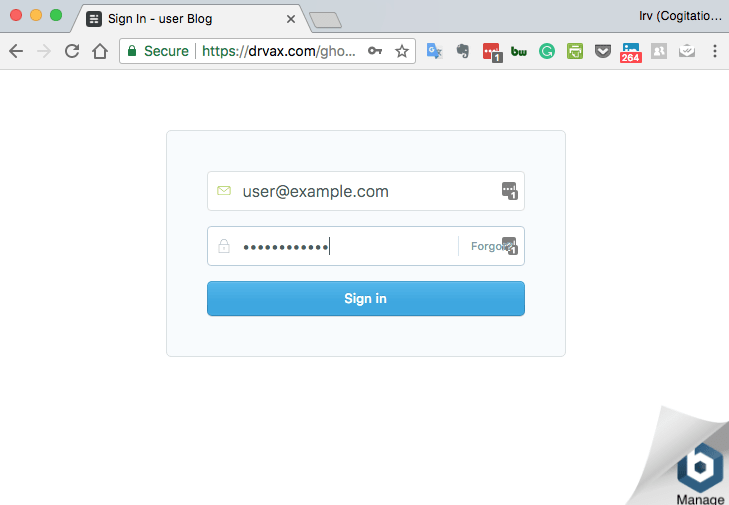 Since the above certificate is only for the domain name drvax.com if you attempt to access your blog via the Elastic IP address or the Amazon assigned temporary domain name you will receive a security warning from your browser. Now back up a couple the configuration files and then use Nano again to make some enhancements. Please note there is a space in the RewriteCond command before the !=on. If you leave this space out your will produce a syntax error. The way this works is that the Apache web server sends a reply back to your desktop or mobile browser that indicates the http site is unavailable and the browser should try the https site instead. Now that our blog is up and running, with a public domain name, utilizing HTTPS it is time to add an email server. 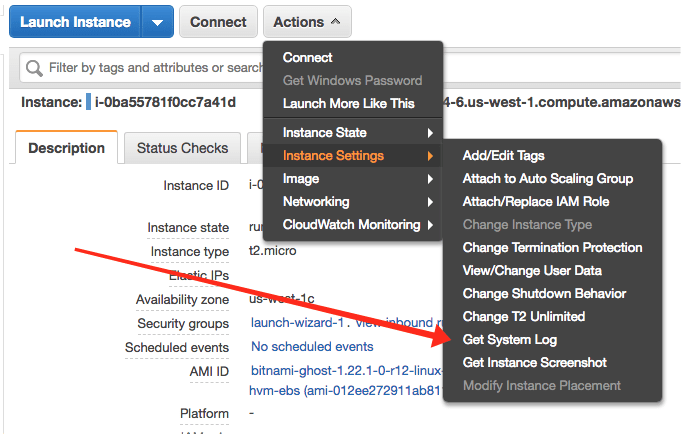 The default Bitnami instances do not include an email configuration. 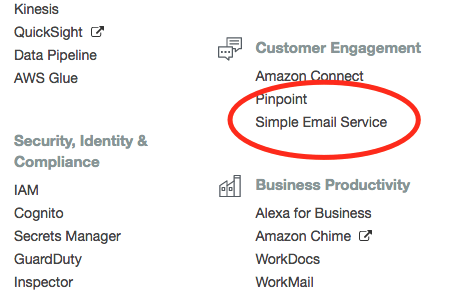 As an AWS user we have access to a full feature email service optimized for the secure programmatic sending of email call SES. Please note that SES (simple email service) is not available in all regions. If SES is not available in the region you used for EC2 you can just select another region. Instances in one region are able to use SES in another region without difficulty. After verifying an SES email identity by clicking on the link emailed to the email address you entered above you need to create an SES username and password. From the SES main screen click on “SMTP Settings” under “Email Sending”. Follow the instructions to create your username and password. Make sure you click on the option to “Show User SMTP Security Credentials” and copy the displayed credentials. You will need these in the next step. with the following, replacing the user, pass, and host with the information appropriate for your configuration. 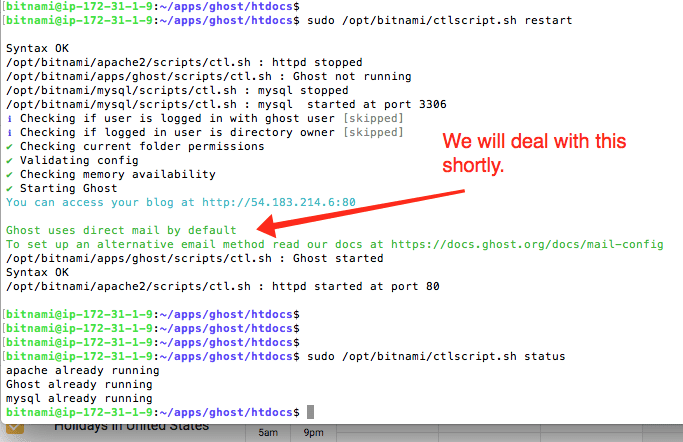 Once restarted there is an option to test your email under the “labs” section on the Ghost admin page. Give this a try and verify that email is working properly. To email errors and logs from the Bitnami AWS instance to your email address you must configure configure an email process for the instance. Use the following command to edit the crontab for the root user. When you are done the file should include the following. The mailto line and the next line which we added to update our security certificate periodically. Now we need to make email work on the Debian host created by the Bitnami installation. Now install the email modules on our instance. When prompted by the postfix install, select “internet site” and make sure the hostname is your domain name. I use have configured postfix to forward all outgoing email to gmail. We will not be configuring postfix to receive email from outside of this node instead we will continue to use gmail directly. For this to work we need a gmail application password. This is different from you standard gmail password. If all went well, you should have a new file named sasl_passwd.db in the /etc/postfix/sasl/directory. If everything is working correctly you should receive the email in a couple of moments. With this configuration all mail commands that use the standard Linux mail environment will send email through your gmail account. If you are using a separate host for email from the host your are using as your web server it helps to make the hostname of the web server different. For example web.cogitions.com. Then also edit /etc/mailname and change all reference in the postfix config files. Otherwise emails sent from the web host to name at domain name will try and deliver to a local user.